Nestled on a slope of Kyōto's Arashiyama district, Tenryū-ji (literally "celestial dragon temple") is listed by the UNESCO as a World Heritage Site. It is the head temple of the Tenryū-ji branch of Rinzai Zen Buddhism. Like other Rinzai Zen temples in Kyōto (Nanzenji, Tōfukuji, Ryōanji...) it is noted for its Zen gardens and extensive white buildings. Tenryū-ji Temple was founded in 1339 by shōgun Ashikaga Takauji in memory of his once ally then rival, Emperor Go-Daigo. Tenryū-ji was originally the site of the Danrin-ji Temple, which was founded in the 9th century as Japan's very first Zen temple. In the 13th century, Emperor Go-Saga and his son Emperor Kameyama (1249-1305) built an imperial villa on the property, which was called the "Kameyama Detached Palace" (亀山殿). The choice of the location owed to the nearby hill resembling the shell of of turtle ("Kameyama" means "turtle mountain"). It is here that Emperor Kameyama's grandson, the future Emperor Go-Daigo (1288-1339), was raised and educated. Go-Daigo left an indelible mark on Japanese history by overthrowing the Kamakura shogunate in 1333 and bringing back the centre of power to Kyōto. The emperor's victory over the shogunate was in great part due to the deflection of general Ashikaga Takauji, who, instead of attacking Kyōto as ordered, sided with the emperor and helped him defeat the Hōjō clan in Kamakura. Unfortunately for Takauji, Emperor Go-Daigo had megalomaniac aspirations and intended to rule as an imperial dictator like the contemporary emperor of China of the Yuan Dynasty. This episode is known as the Kenmu restoration (1333-1336). Things ended badly for the emperor when he sent Nitta Yoshisada to track down and destroy Ashikaga in eastern Japan. Ashikaga won, and after a series of battles around Japan eventually entered Kyōto and forced Emperor Go-Daigo into exile in the mountains of Yoshino. Takauji, now sole master of Japan, installed a puppet emperor and declared himself shogun, hence founding the Ashikaga shogunate (also known as the Muromachi period). Go-Daigo died a year later in 1339. Following Go-Daigo's passing, a Buddhist priest dreamt of a dragon rising from the nearby river and interpreted it as the uneasy spirit of the defunct emperor. 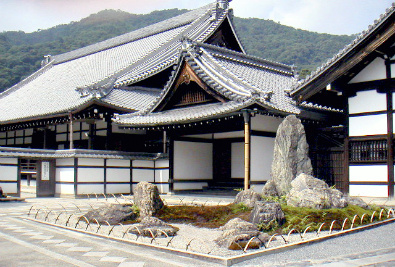 As a result, Ashikaga Takauji commanded to erect a temple to appease Go-Daigo's spirit. Tenryū-ji was ravaged by fires no less than eight times, lastly in 1864. 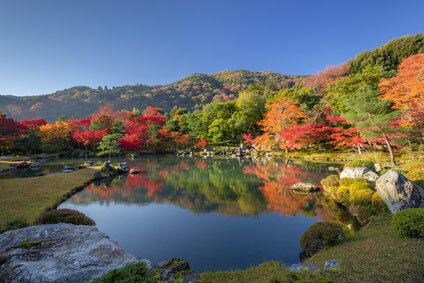 Although the present building only date from 1900, the 14th-century landscape garden is one of the oldest in Japan. Tenryū-ji's fine Zen garden are the work of Musō Soseki (1275-1351), one of the most famous Buddhist monks of his time. Hr was an accomplished artist for calligraphy, poetry and garden design. He layed out the garden around a pond with the hill as a backdrop. 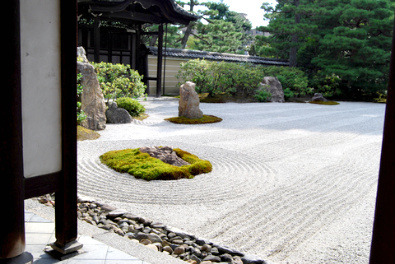 Rocks were scrupulously placed around the garden in accordance with Zen principles. The garden is designed to be viewed from inside the temple. A dry Zen garden acts as buffer between the wooden terrace and the pond. The temple is open daily from 8:30 am to 5:00 pm. 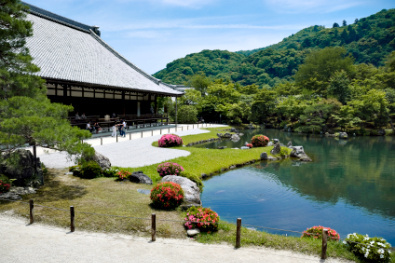 Admission is ￥600 for the temple and garden, or ￥500 for the garden only. 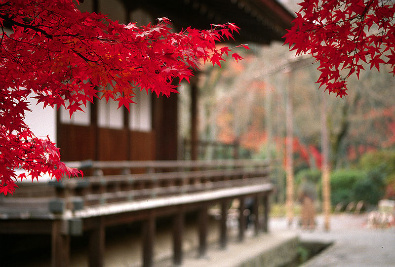 Tenryū-ji is located 700 metres west of JR Saga-Arashiyama Station (17min from Kyoto Station, ￥230). If you coming from the cluster of temples in northern Kyoto (Kinkaku-ji, Ryōan-ji, Ninna-ji) or from the western side of the city centre (e.g. Nijō Castle) the easiest way is to hop on the Keifuku Arashiyama line until Arashiyama Station, from where it is only a short walk north-west to Tenryū-ji. There are Keifuku stations in Ryōan-ji and Shijō-Ōmiya (halfway between Nijō Castle and Nishi-Hongan-ji Temple). The journey takes 22min and costs ￥200 from either station.